“Savanna” by Rock & Rose Landscapes & Greenlee & Associates, won the Best of Show award – and the Garden Creator’s award at the San Francisco Garden show yesterday. I wasn’t surprised. It’s a really beautiful landscape environment with tall grasses and reeds. There was also a raffle to win the garden with the proceeds going to San Francisco Botanical Garden at Strybing Arboretum. 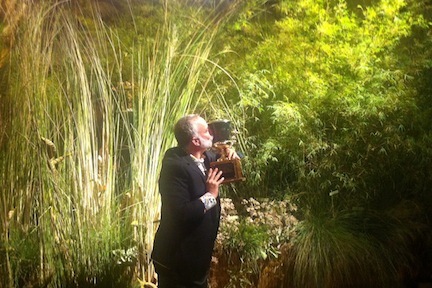 Here, Mike Boss is kissing the award.